Dr. Jin Y. Kim, a periodontist with offices in Diamond Bar and Garden Grove, is welcoming new patients interested in learning about the advantages and possibilities of dental implants in Santa Ana, CA, to replace missing teeth. When placed by a trained periodontist like Dr. Kim using high-tech guided placement equipment for precise implantation, dental implants can last for decades, reversing the negative impacts of missing teeth. 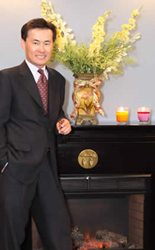 Well-respected periodontist, Dr. Jin Y. Kim, is expanding his practice area and welcoming patients interested in learning about the short-term and long-term value of getting dental implants near Santa Ana, CA. As a leading periodontist in his area and a specialist renowned internationally as well, Dr. Kim has years of expertise in dental implant placement to restore tooth function and cosmetic appearance. Dental implants have risen as a leading tooth replacement solution for those with at least one missing tooth. Recent statistics from the American College of Prosthodontics indicate that up to 120 million people across the nation have lost at least one tooth by adulthood. Dental implants offer a safe alternative to the health risks, as well as physical and emotional discomfort of smile gaps. When a natural tooth falls out or is extracted, bone reabsorption occurs at the site. Over time, this can lead to a “sunken” look around the gums and affect facial shape. It can also break down bone density in that region of the mouth, affecting the nearby teeth. Additionally, many people who are missing at least one tooth complain of problems eating and speaking and may feel self-conscious in social situations. When placed by a trained periodontist like Dr. Kim using high-tech guided placement equipment for precise implantation, dental implants can last for decades, reversing the negative impacts of missing teeth. Designed to match the appearance of the remaining teeth, dental implants are virtually indistinguishable from natural teeth. Patients interested in speaking with Dr. Kim about replacing their missing teeth with dental implants in Santa Ana, CA, are urged to make an exploratory examination appointment at one of his offices. His Diamond Bar, CA, location can be reached at 909-860-9222, and West Garden Grove facility at 714-898-8757.